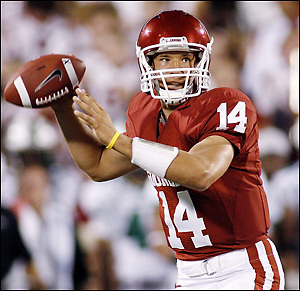 Seemed appropriate to start with his own “official” site, sambradford.org. I note that he appears to be an inch taller in his own mirror than in most of the mirrors used by those scouting him below. Could be a rounding thing. For you numbers types, his college statistics (ESPN). - Blogger Jim Turner’s take on the Bradford-to-Washington possibility. What the hell ... if you’re anything like me, the one thing you really want to do is watch the man play with your own eyes. These are highlight reels of course, so don’t expect to see too many strip/sacks or braindead interceptions. As long as you watch them with that in mind, though, seems to me you can get a pretty good feel for things like read/react time, ability to slide in the pocket, ability to make certain throws he’ll need on the NFL level, maybe even get a taste for his overall body language. One N.F.L. scout, who spoke on condition of anonymity because he is not permitted to talk publicly about draft prospects, said Bradford was a “no-brainer” overall No. 1 pick and compared him to Troy Aikman, the first pick in the 1989 draft. Bradford is ranked No. 1 by some draft experts, and there are only minor questions about him. Bradford, 21, has not quite filled in his 6-foot-4 frame — he is listed at 218 pounds — and Oklahoma’s offense has kept him from facing much pass-rush pressure. Still, the positives are considered impressive. Even allowing for some hyperbole, that's a pretty notable assessment. Bradford's injury early in the 2009 college season ("the injury issue") would only really concern me if I thought new Redskins HC Mike Shanahan intended to start Bradford as a rookie. I can't imagine that would be the plan though, so I am comfortable enough with the Redskins medical assessment team to make an informed decision on whether or not they believe any medical concerns are long-term. Dammit Jim, I'm a football fan, not a doctor. As to the player himself ... truth is, videos and scouting report feast aside, I simply haven't seen him play enough to make a truly informed assessment. I will say, however, that from what I have seen, he's pretty damn accurate (been a while since I have seen Redskins receivers catching passes in full stride), makes quick decisions and releases, and "looks" like he has it going on upstairs. If I have one overriding nagging concern it's that the man looks like he'd blow over in a stiff NFCE November wind. If the Redskins do end up drafting Bradford, I hope they plan to mainline a whole lot of protein into him. Bottom line, I am long on record as believing you do whatever it takes to land a true "Franchise QB," and if you think you've found one, you don't hesitate to pull the trigger. I know it's a big "if," but if Bruce Allen and Mike Shanahan decide, after putting in a thousand times the amount and depth of research as I have, that Sam Bradford is that kind of player ... as of late January, I'll admit I'm intrigued enough by the guy not to run out of the room screaming. Feel free discuss (or tell me why I'm wrong). Don't we already have a super accurate QB on our roster who's spent the past two seasons being beefed up by our conditioning coaches? I'd rather give Colt Brennan a chance.